Siblings Chitharanjan, 31, and Ashwini, 25, who are mentally challenged and physically disabled, are victims of aerial spraying of endosulfan, a pesticide that crippled thousands of lives in the district. The pesticide was banned in 2011, about three decades after its extensive use on the cashew plantations of Plantation Corporation of Kerala. The residues of the pesticide seem to be found in the region — in water, soil and produce — that children are born with deformities and mental disorders even after eight years of its ban. 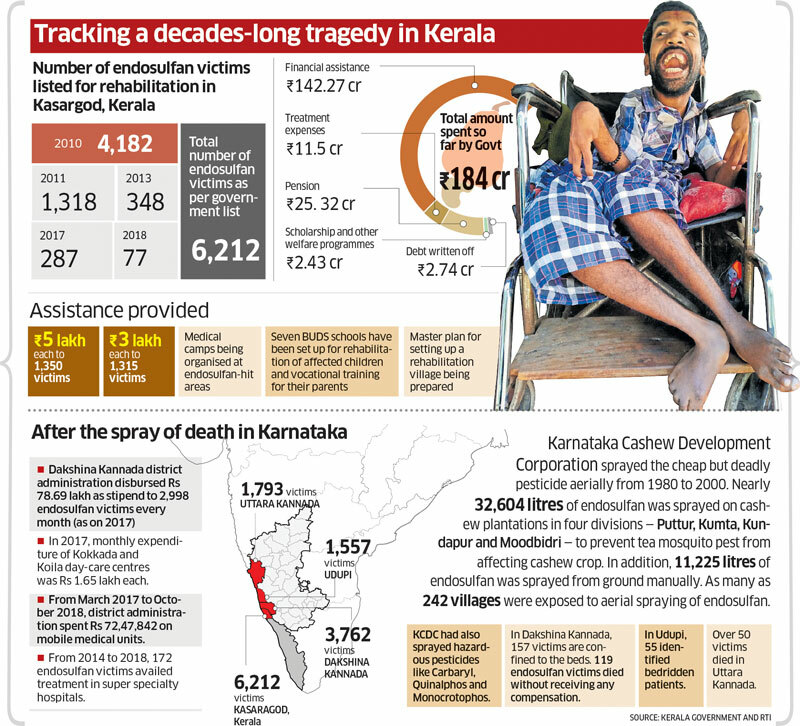 But the Kerala government is yet to acknowledge all the sufferers as victims of endosulfan poisoning. For the simple reason that they do not belong to any of the 11 village panchayats that were declared endosulfan-affected. As a result, they are deprived of the assistance that the government has offered to endosulfan victims. A visit to some of these villages makes one understand their anger and annoyance towards the administration. Hundreds of victims who are denied assistance under the support scheme for endosulfan victims had gathered in Thiruvananthapuram recently to protest against the government’s apathy. One of the worst-affected areas is Puthige Panchayat, which lies close to Enmakaje in the northern parts of Kasargod, close to Karnataka. “For many years, we have been knocking at the doors of the administration. 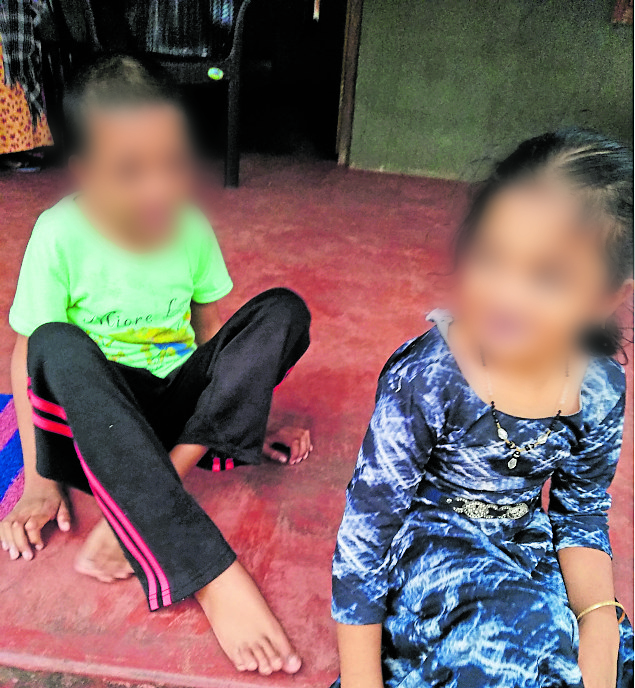 But they have been turning down our pleas without any humanitarian consideration,” say Mehamood and Kunhamini at Seethangoli, 25 km from Kasargod town. Three of their eight children have physical deformities. Renjith Kumar, the sibling of Chitharanjan and Ashwini and the sole breadwinner of the family, points out that the stream flowing through the locality comes from Enmakaje and hence it is almost certain that the people of the locality are also victims of the pesticide that was widely used at the plantations in Enmakaje. “Since my two siblings are bedridden, our parents are almost confined to the house to take care of them,” Renjith told DH. “There is no history of such mental or physical disorders in our family. If the authorities are still maintaining that many like Akhila in the locality are not victims of the pesticide, then they should be able to give a convincing reason,” says Akhila’s grandmother Kamala. Deformities, mental disorder and seizures are some of the common problems faced by endosulfan victims. A considerable number of them also suffer from peripheral sensory system disorders. “We had taken the child to several medical screenings for inclusion in the list of endosulfan victims. But the bureaucracy rejected the plea citing boundary issues,” says Dhanya, mother of an endosulfan victim. “We just have one prayer. At least give them the strength to move around for their basic needs. As they grow up, it will be more difficult for us to take care of them,” says Khadeeja, whose two children are paralysed. According to Ambalathara Kunhikrishnan, an activist fighting for the endosulfan victims, even the Kerala Government had initially agreed in principle that 27 panchayats and three municipalities in Kasaragod were affected by endosulfan. The National Human Rights Commission also shared a similar view. But the government is now showing reluctance to consider victims from adjacent panchayats. Former Kerala Chief Minister V S Achuthanandan and other Left Democratic Front (LDF) leaders had backed the stirs by endosulfan victims while they were in the Opposition Party. Now the party is in power but it is yet to take an action in this regard. In 2017, the Supreme Court ordered the Kerala government to pay a compensation of Rs 500 crore to over 5,000 victims with around Rs 5 lakh to each victim. But activist Kunhikrishnan said that the government paid a compensation of Rs 5 lakh to only 1,350 persons and another 1315 were paid Rs 3 lakh each. Another immediate requirement is hospitals with specialist doctors. A medical college hospital announced in 2011 is just in the beginning stages of construction. The hospitals in the district lack specialists like neurologists. As a result, many endosulfan victims are depending on private hospitals in Mangaluru, which is around 60 km away, even for routine check-up. While rehabilitation and medical assistance are of utmost importance to the victims, the families are in dire need of financial assistance, said Mohan Pulikodan, a volunteer who works with these unfortunate people. Generally, one person in a family has to devote full-time taking care of the victims. But more assistance is required if there are more victims in a house. Most of these affected families are financially weak and are in constant need of money. But so far, there is no proper assessment of the requirements of these families. “We provide personalised training and therapies after analysing the requirements of each person. The main aim is to enable them to carry out activities of daily living. At present, the school is having about 85 students in the age group of 3 to 28 years. Vocational training on various skills like bag making is imparted to their parents,” she said. Various NGOs are also running rehabilitation centres for endosulfan victims.